It's been another good month for finishing things up! Here are my monthly empties and whether I would choose to repurchase them:- The Body Shop Mango Body Butter - I have probably tried all of the flavours from the standard body butters range and must admit that Mango is the one that I like the least. The scent is just far too sickly for me, which is a shame because the formula is great for dry winter skin. Repurchase? No. Lush Snow Fairy Shower Gel - Have been using up the little bottles of this that I acquired at Christmas and still love it, wish it was available all year round! Repurchase? Definitely. Weleda Pomegranate Regenerating Body Oil I love oils and this is just so lovely to use after a shower. Repurchase? Yes. Neal's Yard Remedies Power Berry Daily Moisture Cream - I was recommended this by a Mac MUA as it's great to use on oily/combination skin if you don't want to use a primer. It does smooth out the skin nicely which creates a good base, but I found the more that I used this, the dryer my skin sometimes got towards the end of the day. Repurchase? No. Barry M Imperfection Correction Concealer Pen in Shade 3 - The worst item I have ever bought from Barry M, it didn't suit my skin at all, looked awfully cakey and dried up in less than a month. Repurchase? No. Dr. Hauschka Cleansing Cream - I was excited to try this out after reading some rave reviews but it sadly didn't suit my skin and smells awful. Repurchase? No. Green People Fruitful Nights Night Cream - Can't vouch for the younger looking skin claims, but this was lovely to use and made my skin very soft and smooth in the morning. I also liked how a little went a long way with this. Repurchase? Yes. Rose & Co Rose Petal Salve - As much as I liked using this up, I'm trying to steer clear of products that have petroleum in them so I'll try and find a similar product that is natural. Repurchase? Not sure. Monu Recovery Balm - Such a tiny sample that it's difficult for me to judge really, thought it was OK from what I used. Repurchase? Probably not. Leonor Greyl Palme Oil - This little 25ml bottle has lasted me several months of weekly uses. I liked it, but probably not enough to buy a full size due to the price. Repurchase? No. Santaverde Aloe Vera Creme Light - I think I'm super sensitive to aloe vera as this irritated my skin so much so that I had to wash it off straight away, not for me! Repurchase? No. Colbert MD Nourish Eye Cream - This was the famous £90 eye cream sample from a Boudoir Prive. My verdict? It was OK, but my significantly cheaper Clinique one is much better and far more moisturising. Repurchase? No. Love your empties posts as well! 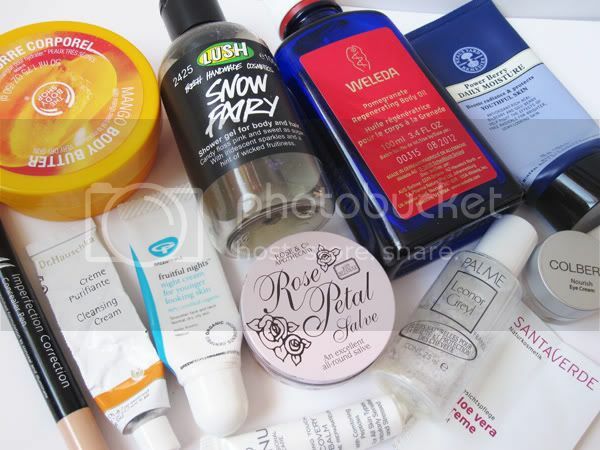 I've tried that Dr. Hauschka cleanser and it's kind of weird-I didn't mind it, but then it kind of felt like my skin wasn't getting clean-that it was just getting dirtier. Tossed it. thanks! :) yeah it's so strange, glad I tried out a sample first. I love these kind of posts to see what everyone's been using up! Especially when I hated things and other people hate them too. I should do one of these posts myself but i have so much to use up I end up getting rid of it as soon as it's empty to create more space! 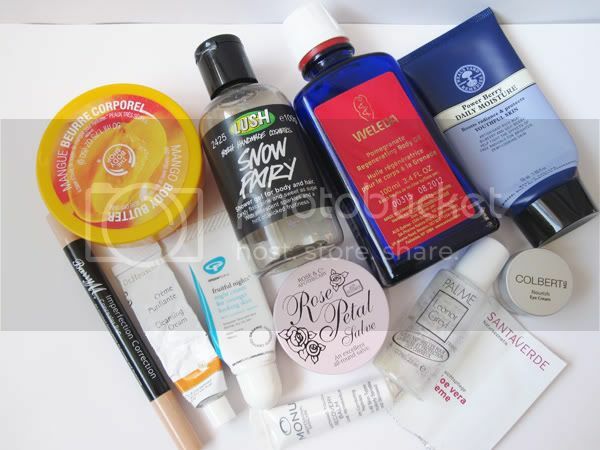 you should do an empties post, i'd love to see! i know what you mean though, i generally store my empties throughout the month in one of those big Carmine boxes, but sometimes i end up putting big items like shampoo bottles into the recycling because i need space! I'm having a love-fest with Leonor Greyl products at the mo, bought the palm oil from a blog sale, cant wait to try it. Ahhh Snow fairy! I still have my big bottle that I received on Christmas two years ago and I barely touch it because I don't want to use it up LOL! I wish the gel was thicker and more foamy though but hey, I guess the smell is worth it all! i was very tempted to purchase a big bottle of Snow Fairy in the sales, but I received quite a few of the little ones for xmas. agree with you - i do wish the formula was a bit thicker!